This is an interview with a member of Leeds Fans United against Racism and Fascism (the first football fan-based group in Britain set up specifically to fight racism) from the Leeds Anti Fascist Action newsletter 'Attitude' in Spring 1994 along with issues of LFUARAF's fanzine 'Marching Altogether'. An interview with a member of Leeds Fans United against Racism and Fascism. LFUARAF was set up in 1987 and is widely recognised as the first campaign of it's kind in the country. 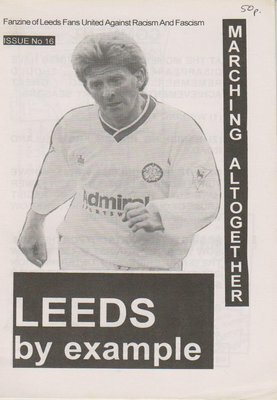 The atmosphere at Elland Road was intolerable in 1987. Both the racism in the ground and the fascists peddling their filth outside. The club said that there wasn't a problem and so the Leeds Trades Council and AFA produced a report showing just how bad the situation was. The club's response wasn't great and we didn't get any support for our campaign. We had to do all the running ourselves. How did the idea of a fanzine come about? We started with a couple of leaflets to test the water and lots of anti-fascists came to help us in that first year. The response was pretty mixed and we realised that the problem was that people felt outsiders were coming in to leaflet. What we needed was a campaign run by football fans themselves and the fanzine was the best way for us to do this. It gave us a chance to get our people listening to our ideas. We slagged off the fascists but we also talked about issues that affected the fans – all-seater stadia, the club treating fans badly, etc. The political message in the fanzine was strong but it wasn't all about well-intentioned lefties telling people what to think. It was about people that cared passionately about football and Leeds United and wanted to give people the confidence to speak up. We used cartoons about fascists and football (nominating 'crap haircut' awards being our favourite). 'Dickhead in the crowd' was a way of pinpointing individual racists to shut them up. 'Eric the football hooligan' and '101 things to do with a nazi skin' made regular appearances. Well, the fascists gave up in 1991 as people became more hostile towards them and told them where to go. Inside the ground, the racist chanting was gone, but there's still a lot of individuals there that need confronting. It's getting better but there's more to do.... You still don't see that many Black and Asian faces on the terraces. It's worked because we've done more than just a campaign about racism. We hope we've made people think about these issues and we've tried to help change the atmosphere down there. The club's improved performance and the signing of Black players has probably done much to change things. So with the fascists gone where do you go from here? As I said, there's more to do than just get rid of fascists. We'll carry on with issue 19. There's plenty more racists to get rid of and besides, the fanzine gives people a chance to write about their club. If we just stopped then in a few years the fascists might go back down there and we'd have to start all over again. It was really hard when we started – fascist thugs can be pretty intimidating, but by being organised we learnt to look after ourselves and they faded away, and the long-term work is better than going through that again. bloody soccer. there are a bunch of red attitudes on this website! theyre all shite mate. soccer is divisive, distracting, encourages nationalism and is a mortal sin and all players are going to hell! FACT! I think 'malatesta' is taking the piss, mate..
Or did I use that in the wrong way? Is it just me who can't download the 'attached' fanzines? I think it might be because of the '#' in the filename. Can an admin rename the files or would I have to reupload them again? What else would you expect from Dirty Leeds?